Sarah, trail angel name Catwater’s Kid, picked me up in Seattle for a wonderful weekend in Cascade Locks and he Columbia Gorge. 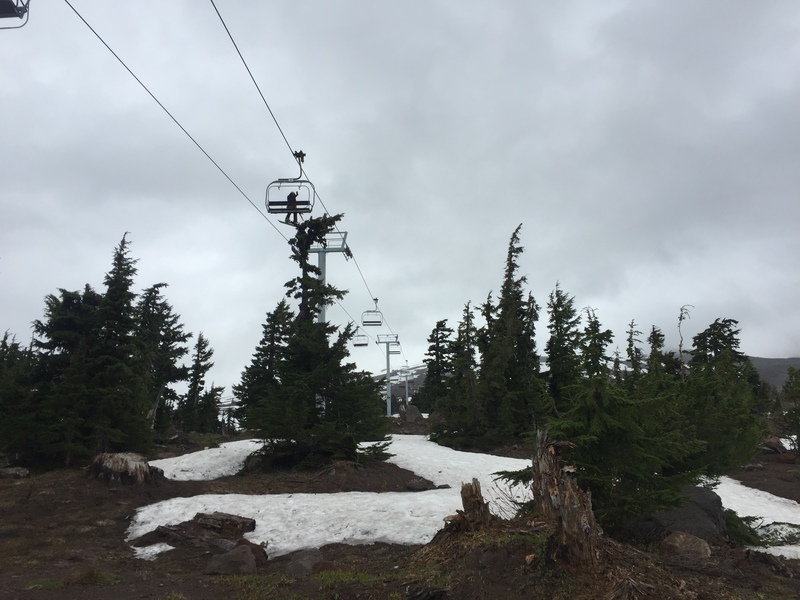 We drove to Timberline on a blazing hot day and walked north on the PCT a little way to discover snow patches on the trail, consolidated and melting fast, not going to be an issue. We day hiked to falls from the 100 year old scenic highway running above Hwy 84 on he Oregon side. It was in the 100’s, good thing I’d been acclimatized to heat in Hawaii a few weeks ago. 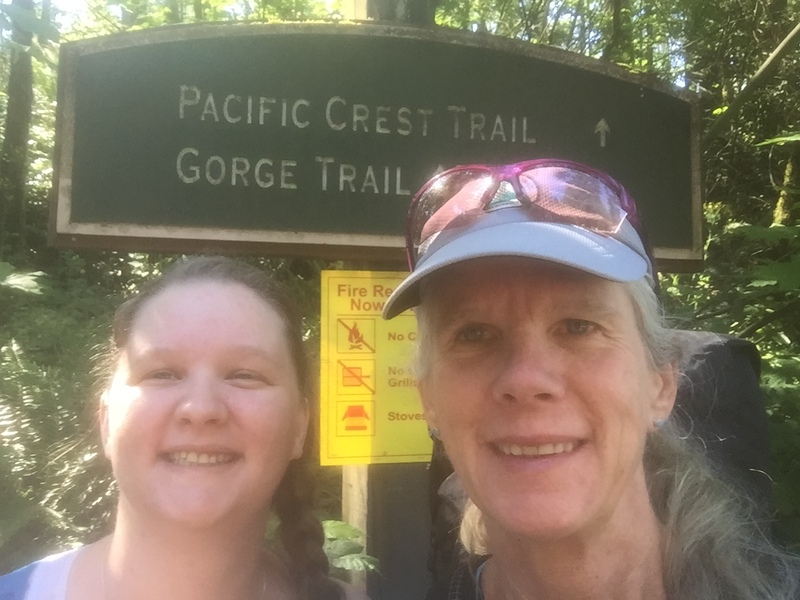 We had a great time and I had a hard time saying so long as I began the interminable trudge up out of the lowest point in the PCT in the heat. Over the next 3 nights I camped alone and saw very few hikers, such a different beginning from the Campo end last April. Second night I was at disgusting Salvation Spring where I camped last year heading north (1 night between Timberline and CL) and about 7:30 pm I heard music a long way off, thankful the couple with the speakers on their packs continued on past me. Lots of bugs and blowdown on the Columbia Gorge side of the trail, but also hummingbirds zipping around buzzing like mini bombers, fuschia to pink rhododendrons, and a zillion other flowers in bloom. The trail tread is in good shape, the stream crossings are shallow and safe, but I’m definitely looking forward to walking downhill off Mt Hood. 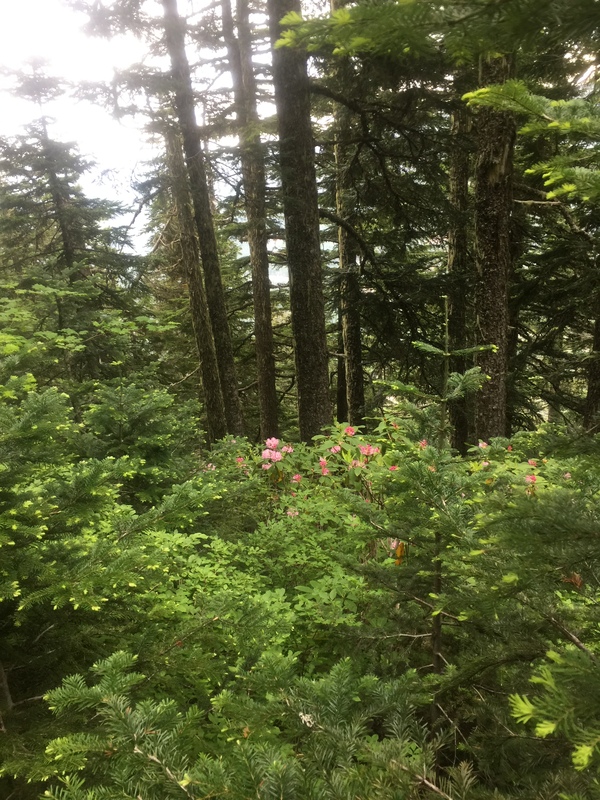 Funny how the trail routines come back without thought: scanning for flat places to camp, mixing Aqua Mira water purification drops, heating water in the morning for coffee and granola, listening and looking as I trudge along, happy to be able to hike in the wild. Plus I did a good deed already! Day 1, 2 brothers going north asked me to pick up their lost, fancy 11 oz water bottle and bring it to Timberline for them. They were super nice and understood the weight penalty they were giving me. I found it within 15″ and carried it the rest of the way. This too is what I love about trail life. So this is just a test? Are you going to skip over this part when you officially start? I assume you are aware of travail closures in SoCal. Some are supposed to open in mid-July. I heard one has no alternate and you have to exit. Long way off but if still in affect when you get there I’ll figure out where I can pick you up. Alison, It’s great to hear from you again. I love the license plate. Hope you have a great trek south bound. Let me know if I can help out in the San Diego area. Excited to follow you again on the trail! Don’t forget I am on the Ebbetts Pass and close to the Sonora Pass! If you need something let us know! Good trekking to you Catwater! Please check all wells before drinking this year, OK?